Many times, the most intense love stories take place solely in the mind. As humans, we mythologise and fantasise - whether or not our love is requited, we create grand narratives, and place on a pedestal the objects of our affections. We often create identities for our suitors based entirely on what we want to see, rather than what is there - we lie to ourselves, follow confirmation bias to extremes and project illusions on to Rorschach canvases in order to satiate our hearts. Love, particularly for the loneliest of souls, is often an illusion or, at the very least, the projection of desperate hope. Love is, they say, a socially accepted insanity. Not too long ago talking to one's self in public would be considered a madness too. Yet, as technology and it's presence in day-to-day living has grown in it's omnipresence, we humans have taken to detaching ourselves from the world around us; we queue outside shops to purchase machinery which means we don't have to see life around us with our own eyes any more and we, en mass, make public displays of grief when a man who sells us these machines dies. Like composed feeling of love, these too exist to stave off loneliness - a mind attached to a machine, scrolling through endless reams of Tweets and viral videos, has no time to comprehend solitude or mortality. We fetishise the products that give us this freedom, this escape from loneliness and, oftentimes, eschew real companionship as we indulge ourselves with technology - it's not uncommon for men to sacrifice real intimacy in exchange for more time spent staring at non-judegemental screens. 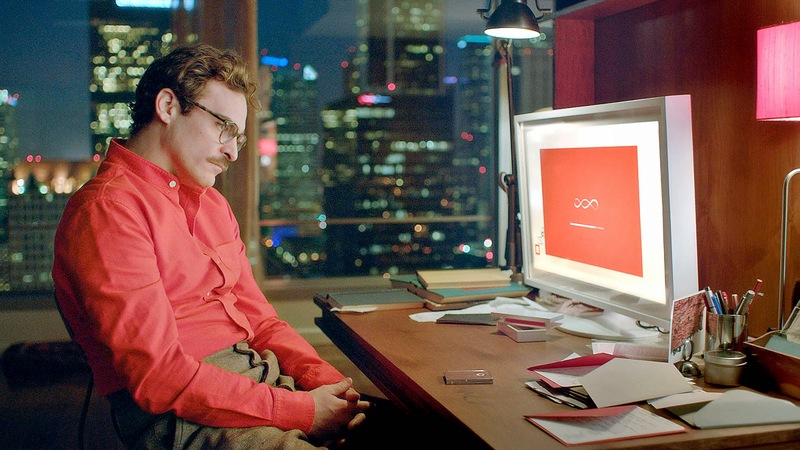 It is in this peculiar state of mind which Spike Jonze takes us with this fourth feature film Her. Joaquin Phoenix stars as Theodore Twombly - a remote, detached individual who makes a living writing articulate personal letters for those too busy to commit to composing their own notes. Yet, despite the warmth of his prose, Twombly seems to exist at a disconnect to the world which surrounds him, interacting much more with IT than with people. The only hope of making a connection in this life, having suffered an excruciating split from his soon to be ex-wife (Rooney Mara), comes in the form of the world's first artifically intelligent operating system who names herself Samantha (Scarlett Johansson). Lovesick and lonely, Twombly begins to fall for software which, despite its lack of physical presence, provides non-judgemental advice and companionship. He's a lonely heart, she is playful, flirty and shares the dry, throaty tones of Scarlett Johansson - their burgeoning relationship is almost inevitable. Like all romances, Theodore and Samantha experience all the emotions fallible humans suffer as they pursue love - insecurity, elation, jealousy and longing. To Theodore, his feelings are real but, to the audience, watching a man engage in something that looks and feels so similar to the love of which we are used to causes concern and sensations similar to "uncanny valley". As Phoenix's face radiates the joy that comes with the first flourishes of amour, we find ourselves entranced and bewitched - elation is contagious but, it would hardly take the most committed Luddite to become concerned and ill-at-ease at the blossoming relationship unfolding before our eyes. As Twombly begins to soar, spinning around in public with gleeful abandon, it's hard not to be touched by what appears to be euphoria but masks clear melancholy and an escape from sorrow which is steeped entirely in artifice. For those in society who seem unable to function if they leave home without their smartphone, Her may make for sobering viewing as we are asked to re-evaluate our relationships with technology. Is our reliance really healthy? Like Don Jon, Jonze feature is an astute look at how our perceptions can be warped through illusions presented to us and how often real life cannot match fantasies cultivated through our engagement with technology and new media. Yet, Her suffers from feeling rather cold and oddly distant - perhaps this is by design? Whilst Phoenix delivers a magnificent, emotive performance as the film's protagonist as we observe him leave depression behind and we see, through his eyes, the beauty of a man rediscovering the joy in his life (no matter how impermanent this may be), there seems to be little magic or humanity in the world around him. Whilst Jonze's debut and sophomore features (Being John Malkovic and Adaptation respectively) centred around grand ideas, his previous movie Where The Wild Things Are seemed a huge step forward for the director in terms of engaging his audiences on an emotive level. Her, in this respect, has much more in common with his first two films - concerned with exploring wider themes rather than the internal lives of the characters in his narratives. Here, we catch the glimpse of a soul named Twombly, lonely in crowds, struggling to find a connection in a shallow and empty world yet we don't really learn what drives him beyond sorrow. A film with a smart, witty, relevant theme but, like the operating systems found at the heart of the tale, there's no heart to be found behind the production. Great Review! I'm excited to see this movie. I want to find an extrapolation of what we see today with our technology. This science-fiction way to do things - focus on some theme and go beyond ( and to the limits) just to find a new way of thinking or just to afirm an old or common way of thinking the humanity keeps having.